Naughty and Nice Book Blog: Love with Altitude Series by Daisy Prescott - 99c SERIES SALE!!! 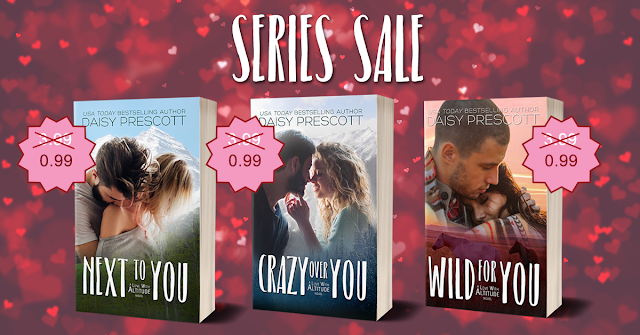 Love with Altitude Series by Daisy Prescott - 99c SERIES SALE!!! #1 Next to You – 99c SALE (US only)!!! Next to You is a standalone Romantic Comedy/New Adult Romance about a rugby player and an heiress in Aspen. #2 Crazy Over You – 99c SALE (US only)!!! Crazy Over You is a standalone romantic comedy set at high altitude. #3 Wild for You – 99c SALE (US only)!!! Wild for You is a standalone, slow burn cowboy romance set in the Rocky Mountains.